Hangin' With The Nuss: Back in front of the TV ... finally! That took a heck of a lot longer than it was supposed to, but it doesn't look like I missed a whole lot. The higher seed won every game again this morning, and the only game that was even really close was UNLV's win over Georgia Tech. That now makes 15 games in the books, with 14 higher seeds winning. Things are shaping up to be a little more interesting this afternoon, as Winthrop is trying to hang on against Notre Dame, and Wisconsin is getting inexplicably drubbed by Texas A&M-Corpus Christi in the first half. I'll have some thoughts after those games end. In the meantime, here's to hoping the mildest Tournament in memory takes a dramatic turn today. 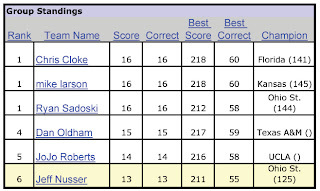 I also included the Bracket Challenge standings -- looks like I need to pick it up!